Christopher: don’t you dare to cross the ocean! This is not an article designed to manipulate your opinion. This is a collection of information that was conveniently omitted in an article that does aim to manipulate your opinion. It is provided so that you can form your own opinion with complete information at your disposal. – They kindly ask. That is all they do. The candidates are not under contract to give any money to Mars One. They have no way of enforcing this request. This is simply a polite request asking them to continue their support of Mars One, as they are now very close to being part of their project. This request, along with gentle advice given to assist non-media savvy candidates, was additionally covered by an NDA, signed by all the Mars100. The public’s interest is generated by Mars One and their project, making any profit coming from interviews done by the candidates logically tied to MO. However given previous experience, it is unlikely any of the candidates will be offered payment. – The media are reporting a lot of things about Mars One. It would not be the first time when their information was inaccurate or misleading. Even though it would be desirable that Mars One corrected every false statement, they cannot be held responsible for how the media interpret and phrase their reports about Mars One. – There are no “leading contenders” at this point. The point system you see on the website is nothing more than a collection of “achievements” based on how far the community member advanced through the selection process or how much money they contributed through donations or purchases. Like many online communities, Mars One uses “badges” to encourage engagement. The points awarded have nothing to do with a candidates selection status. So although it is accurate to say they’ve “bought” their points with donations, these points do not influence their standing as far as the selection process goes. There are many candidates in the final 100 who have not donated anything to Mars One except for the initial application fee, and have, perhaps, bought themselves a T-shirt. – You do not get points. You get badges. It is called ‘gamification’ and is designed to provide fun and engagement to the participant. Non-candidates also get badges for their participation in supporting Mars One. 5. “I have not met anyone from Mars One in person,” he said. “Initially they’d said there were going to be regional interviews… we would travel there, we’d be interviewed, we’d be tested over several days, and in my mind that sounded at least like something that approached a legitimate astronaut selection process. Mars One is only half-way through their selection process. It would have consumed inordinate amounts of time and money to go through rigorous testing for 660 Round 2 candidates. The psychology and capabilities of each individual will be tested in Round 3 and subsequently in Round 4 for those advancing further. The testing that will be done during Rounds 3 and 4 will be narrowing down the number of candidates from 100 to 24 or less to enter training – a number comparable to the number of astronauts that enter NASA training at a time. Roche notified Mars One he was dropping out even before the official public notice was released . Had he waited just one day more, he would have learned from Dr. Kraft that there will, indeed, be face-to-face meetings, instruction, and testing for the Mars 100 this fall. There are now several videos available freely through the internet where Norbert Kraft discusses the logic behind the online interviews. Dr. Kraft is a psychologist, and one with extensive experience in the field. It would be safe to assume that Dr. Kraft has more insight into the psychological testing done through the interview than the candidates do. Only 2 of the total 4 selection rounds have taken place thus far. Rounds 3 and 4 are more geared towards psychological evaluation. Of course, the 8 years of intensive training, including a simulated environment, will be even more crucial in identifying the suitable candidates. It is a mistake to think of 2 selection rounds in an entire process spanning nearly a decade as representative of the process as a whole. The Mars One project is very different to a typical NASA mission, and therefore has very different requirements for its astronaut candidates. The Mars One candidates would be primarily colonists, not astronauts or pilots. The Mars Transit Vehicle will be assembled in orbit by a trained crew, and the colonists will board the MTV in orbit. It is likely that course corrections and landing procedures will be automated – for uncrewed as well as crewed spacecraft. There will be 10 years of training between selection and launch, which absolutely does compare to NASA’s level and depth of training. This training will likely cover emergency manual control of spacecraft. Of course not. It only serves to judge whether it is worth investing more time and money into evaluating a candidate further. Which is why the selection process will go through two additional, much more thorough and in-person, selection rounds. The primary source of finance is to be an investment firm in the first stages of the mission (leading up to and including the first manned mission). The documentary and live broadcast aspects of the project are expected to bring in revenue at later stages of the project. Mars One is in talks with both an investment firm and a new production company to take over the documentary aspect of the project. Collaboration with Endemol was reportedly ended as they were unable to reach an agreement over the terms of the contract. The $6 billion in revenue was never stated to be entirely funded from one source. Gerard ‘t Hooft did indeed express some skepticism. He is one of the many members of the international scientific community whose opinions should be taken into account. Among extraterrestrial bodies in our solar system, Mars is singular in that it possesses all the raw materials required to support not only life, but a new branch of human civilization. This uniqueness is illustrated most clearly if we contrast Mars with the Earth’s Moon, the most frequently cited alternative location for extraterrestrial human colonization. In contrast to the Moon, Mars is rich in carbon, nitrogen, hydrogen and oxygen, all in biologically readily accessible forms such as carbon dioxide gas, nitrogen gas, and water ice and permafrost. Carbon, nitrogen, and hydrogen are only present on the Moon in parts per million quantities, much like gold in seawater. Oxygen is abundant on the Moon, but only in tightly bound oxides such as silicon dioxide (SiO2), ferrous oxide (Fe2O3), magnesium oxide (MgO), and aluminum oxide (Al2O3), which require very high energy processes to reduce. 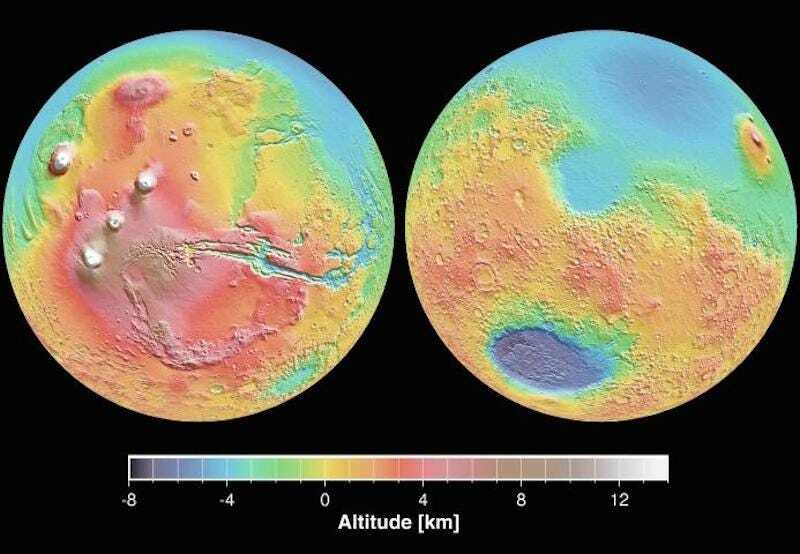 Current knowledge indicates that if Mars were smooth and all its ice and permafrost melted into liquid water, the entire planet would be covered with an ocean over 100 meters deep. This contrasts strongly with the Moon, which is so dry that if concrete were found there, Lunar colonists would mine it to get the water out. Thus, if plants could be grown in greenhouses on the Moon (an unlikely proposition, as we’ve seen) most of their biomass material would have to be imported. The Moon is also deficient in about half the metals of interest to industrial society (copper, for example), as well as many other elements of interest such as sulfur and phosphorus. Mars has every required element in abundance. Moreover, on Mars, as on Earth, hydrologic and volcanic processes have occurred that are likely to have consolidated various elements into local concentrations of high-grade mineral ore. Indeed, the geologic history of Mars has been compared to that of Africa, with very optimistic inferences as to its mineral wealth implied as a corollary. In contrast, the Moon has had virtually no history of water or volcanic action, with the result that it is basically composed of trash rocks with very little differentiation into ores that represent useful concentrations of anything interesting. You can generate power on either the Moon or Mars with solar panels, and here the advantages of the Moon’s clearer skies and closer proximity to the Sun than Mars roughly balances the disadvantage of large energy storage requirements created by the Moon’s 28-day light-dark cycle. But if you wish to manufacture solar panels, so as to create a self-expanding power base, Mars holds an enormous advantage, as only Mars possesses the large supplies of carbon and hydrogen needed to produce the pure silicon required for producing photovoltaic panels and other electronics. In addition, Mars has the potential for wind-generated power while the Moon clearly does not. But both solar and wind offer relatively modest power potential — tens or at most hundreds of kilowatts here or there. To create a vibrant civilization you need a richer power base, and this Mars has both in the short and medium term in the form of its geothermal power resources, which offer potential for large numbers of locally created electricity generating stations in the 10 MW (10,000 kilowatt) class. In the long-term, Mars will enjoy a power-rich economy based upon exploitation of its large domestic resources of deuterium fuel for fusion reactors. Deuterium is five times more common on Mars than it is on Earth, and tens of thousands of times more common on Mars than on the Moon. But the biggest problem with the Moon, as with all other airless planetary bodies and proposed artificial free-space colonies, is that sunlight is not available in a form useful for growing crops. A single acre of plants on Earth requires four megawatts of sunlight power, a square kilometer needs 1,000 MW. The entire world put together does not produce enough electrical power to illuminate the farms of the state of Rhode Island, that agricultural giant. Growing crops with electrically generated light is just economically hopeless. But you can’t use natural sunlight on the Moon or any other airless body in space unless you put walls on the greenhouse thick enough to shield out solar flares, a requirement that enormously increases the expense of creating cropland. Even if you did that, it wouldn’t do you any good on the Moon, because plants won’t grow in a light/dark cycle lasting 28 days. But on Mars there is an atmosphere thick enough to protect crops grown on the surface from solar flare. Therefore, thin-walled inflatable plastic greenhouses protected by unpressurized UV-resistant hard-plastic shield domes can be used to rapidly create cropland on the surface. Even without the problems of solar flares and month-long diurnal cycle, such simple greenhouses would be impractical on the Moon as they would create unbearably high temperatures. On Mars, in contrast, the strong greenhouse effect created by such domes would be precisely what is necessary to produce a temperate climate inside. Such domes up to 50 meters in diameter are light enough to be transported from Earth initially, and later on they can be manufactured on Mars out of indigenous materials. Because all the resources to make plastics exist on Mars, networks of such 50- to 100-meter domes couldbe rapidly manufactured and deployed, opening up large areas of the surface to both shirtsleeve human habitation and agriculture. That’s just the beginning, because it will eventually be possible for humans to substantially thicken Mars’ atmosphere by forcing the regolith to outgas its contents through a deliberate program of artificially induced global warming. Once that has been accomplished, the habitation domes could be virtually any size, as they would not have to sustain a pressure differential between their interior and exterior. In fact, once that has been done, it will be possible to raise specially bred crops outside the domes. The point to be made is that unlike colonists on any known extraterrestrial body, Martian colonists will be able to live on the surface, not in tunnels, and move about freely and grow crops in the light of day. Mars is a place where humans can live and multiply to large numbers, supporting themselves with products of every description made out of indigenous materials. Mars is thus a place where an actual civilization, not just a mining or scientific outpost, can be developed. And significantly for interplanetary commerce, Mars and Earth are the only two locations in the solar system where humans will be able to grow crops for export. Mars is the best target for colonization in the solar system because it has by far the greatest potential for self-sufficiency. Nevertheless, even with optimistic extrapolation of robotic manufacturing techniques, Mars will not have the division of labor required to make it fully self-sufficient until its population numbers in the millions. Thus, for decades and perhaps longer, it will be necessary, and forever desirable, for Mars to be able to import specialized manufactured goods from Earth. These goods can be fairly limited in mass, as only small portions (by weight) of even very high-tech goods are actually complex. Nevertheless, these smaller sophisticated items will have to be paid for, and the high costs of Earth-launch and interplanetary transport will greatly increase their price. What can Mars possibly export back to Earth in return? It is this question that has caused many to incorrectly deem Mars colonization intractable, or at least inferior in prospect to the Moon. For example, much has been made of the fact that the Moon has indigenous supplies of helium-3, an isotope not found on Earth and which could be of considerable value as a fuel for second generation thermonuclear fusion reactors. Mars has no known helium-3 resources. On the other hand, because of its complex geologic history, Mars may have concentrated mineral ores, with much greater concentrations of precious metal ores readily available than is currently the case on Earth — because the terrestrial ores have been heavily scavenged by humans for the past 5,000 years. If concentrated supplies of metals of equal or greater value than silver (such as germanium, hafnium, lanthanum, cerium, rhenium, samarium, gallium, gadolinium, gold, palladium, iridium, rubidium, platinum, rhodium, europium, and a host of others) were available on Mars, they could potentially be transported back to Earth for a substantial profit. Reusable Mars-surface based single-stage-to-orbit vehicles would haul cargoes to Mars orbit for transportation to Earth via either cheap expendable chemical stages manufactured on Mars or reusable cycling solar or magnetic sail-powered interplanetary spacecraft. The existence of such Martian precious metal ores, however, is still hypothetical. But there is one commercial resource that is known to exist ubiquitously on Mars in large amount — deuterium. Deuterium, the heavy isotope of hydrogen, occurs as 166 out of every million hydrogen atoms on Earth, but comprises 833 out of every million hydrogen atoms on Mars. Deuterium is the key fuel not only for both first and second generation fusion reactors, but it is also an essential material needed by the nuclear power industry today. Even with cheap power, deuterium is very expensive; its current market value on Earth is about $10,000 per kilogram, roughly fifty times as valuable as silver or 70% as valuable as gold. This is in today’s pre-fusion economy. Once fusion reactors go into widespread use deuterium prices will increase. All the in-situ chemical processes required to produce the fuel, oxygen, and plastics necessary to run a Mars settlement require water electrolysis as an intermediate step. As a by product of these operations, millions, perhaps billions, of dollars worth of deuterium will be produced. Ideas may be another possible export for Martian colonists. Just as the labor shortage prevalent in colonial and nineteenth century America drove the creation of “Yankee ingenuity’s” flood of inventions, so the conditions of extreme labor shortage combined with a technological culture that shuns impractical legislative constraints against innovation will tend to drive Martian ingenuity to produce wave after wave of invention in energy production, automation and robotics, biotechnology, and other areas. These inventions, licensed on Earth, could finance Mars even as they revolutionize and advance terrestrial living standards as forcefully as nineteenth century American invention changed Europe and ultimately the rest of the world as well. Inventions produced as a matter of necessity by a practical intellectual culture stressed by frontier conditions can make Mars rich, but invention and direct export to Earth are not the only ways that Martians will be able to make a fortune. The other route is via trade to the asteroid belt, the band of small, mineral-rich bodies lying between the orbits of Mars and Jupiter. There are about 5,000 asteroids known today, of which about 98% are in the “Main Belt” lying between Mars and Jupiter, with an average distance from the Sun of about 2.7 astronomical units, or AU. (The Earth is 1.0 AU from the Sun.) Of the remaining two percent known as the near-Earth asteroids, about 90% orbit closer to Mars than to the Earth. Collectively, these asteroids represent an enormous stockpile of mineral wealth in the form of platinum group and other valuable metals. Miners operating among the asteroids will be unable to produce their necessary supplies locally. There will thus be a need to export food and other necessary goods from either Earth or Mars to the Main Belt. Mars has an overwhelming positional advantage as a location from which to conduct such trade. The primary analogy I wish to draw is that Mars is to the new age of exploration as North America was to the last. The Earth’s Moon, close to the metropolitan planet but impoverished in resources, compares to Greenland. Other destinations, such as the Main Belt asteroids, may be rich in potential future exports to Earth but lack the preconditions for the creation of a fully developed indigenous society; these compare to the West Indies. Only Mars has the full set of resources required to develop a native civilization, and only Mars is a viable target for true colonization. Like America in its relationship to Britain and the West Indies, Mars has a positional advantage that will allow it to participate in a useful way to support extractive activities on behalf of Earth in the asteroid belt and elsewhere. But despite the shortsighted calculations of eighteenth-century European statesmen and financiers, the true value of America never was as a logistical support base for West Indies sugar and spice trade, inland fur trade, or as a potential market for manufactured goods. The true value of America was as the future home for a new branch of human civilization, one that as a combined result of its humanistic antecedents and its frontier conditions was able to develop into the most powerful engine for human progress and economic growth the world had ever seen. The wealth of America was in fact that she could support people, and that the right kind of people chose to go to her. People create wealth. People are wealth and power. Every feature of Frontier American life that acted to create a practical can-do culture of innovating people will apply to Mars a hundred-fold. Mars is a harsher place than any on Earth. But provided one can survive the regimen, it is the toughest schools that are the best. The Martians shall do well. “We will go to Mars because it is the one place other than our Earth where we expect human life to be sustainable, and where our colonies could flourish. We will go to Mars because an examination of its geology and history will reflect back a greatly deepened understanding of our own precious Earth. Above all, we will go to Mars because it will inspire us to clearly look beyond the difficulties and divisions of today, to a better future tomorrow. “We must sail sometimes with the wind and sometimes against it,” said Oliver Wendell Holmes, “but we must sail, and not drift, nor lie at anchor.” So with man’s epic voyage into space — a voyage the United States of America has led and still shall lead. Apollo has returned to harbor. Vor ein paar Wochen hatte mich Alejandra Miranda Janus vor allem ueber die inneren Beweggruende befragt, um herauszufinden wie man auf die seltsame Idee kommen kann, der Erde den Ruecken zu kehren. Hier das (schriftliche) Interview. Wie zum teufel kommt man auf die Idee in den Mars ziehen zu wollen ? Wie hast du von Mars One erfahren? Ich bin eigentlich staendig in die “space community” online eingeklinkt und verfolge alles was ich finden kann. Das geht heutzutage ja mit twitter/reddit/facebook recht einfach. 2013 wurde ich auf MarsOne’s website aufmerksam und hab mich gleich beim ersten Besuch in ihren newsletter per email eingetragen. Als dann der Aufruf kam, dass sie Kandidaten suchen hab ich mich sofort gemeldet. Ich musste (konnte?) nicht einmal rational drueber nachdenken. Da waren keine Gedanken von der Art “Ja, aber…”. oder “Was ist, wenn was schiefgeht” “was werden andere denken, wenn ich das mache”. Es war mehr ein Gefuehl von “Endlich! !” oder “Was fuer eine Chance!” oder “Da muss ich mitmachen, allein schon um mit meiner Stimme dem Project etwas mehr Gewicht zu verleihen – und wenn das auch nicht viel ist, die muessen es einfach schaffen!” usw. Wenn es zB. ein Kindheitstraum ist, wie hat es angefangen bzw. erzähl mir wirklich ganz genau was du fühlst und empfindest, wenn du an den Mars denkst…und die Geschichte dahinter. Wie hat dein Umfeld reagiert?? Zwei Reaktionen: Da ich in den USA lebe, kann ich vor allem von den hiesigen Reaktionen sprechen. Die Menschen sind im allgemeinen verhaeltnismaessig fortschrittsglaeubiger und technologiebegeisterter als in Europa. Waehrend meine Familie im weiteren das ganze als “Schnappsidee” abtat und sich wenig dafuer interessierte, war ich persoenlich begeistert. Das erste Mal, dass ich bemerkte, dass jemand anders diese Begeisterung teilt war auf einer Technologiekonferenz, hier in den USA, auf der ich ein MarsOne T-Shirt trug. Es war ein sehr unauffaelliges, hatte nur das kleine MarsOne Emblem. Beim Wandern durch die Konferenz kam ich einem Duo entgegen, zwei junge Burschen. Ploetzlich leuchteten dem einen die Augen auf. Das war lustig! Er kam mit glaesernem Ausdruck auf mich zu und sagte: “Bist du etwa bei dem MarsOne Projekt dabei?” Ich bejahte und er schuettelte mir die Hand und bekraeftigte mehrmals fuer was fuer eine tolle Idee er das hielt und wuenschte mir viel Glueck. Das passierte noch einige Male auf der Konferenz, was witzig war – es war erst ein paar Monate nachdem das MarsOne Projekt gestartet war. Ich war ueberrascht, dass so viele Leute a.) MarsOne verfolgten und b.) eine Kolonie auf dem Mars unbedingt Wirklichkeit werden lassen wollten. Alles sehr positive Stimmen. Nur online, in Foren, flogen die Fetzen und MarsOne wurde als “scam” beschimpft und die Kandidaten als “leichtglaeubig” und “Spinner” verunglimpft – Ich glaube es gibt da einigen Frust, gerade in dem Spannungsfeld zwischen effizienterer, idealistischer neu-privater Raumfahrtindustrie wie spacex (an die MarsOne als Privatunternehmen anknuepfen moechte) mit hochfliegenden Plaenen und typischer “roll-up the sleeve” und “can-do” Mentalitaet versus den schwerfaelligen altehrwuerdigen staatsnahen Betrieben/Behoerden die Bezweifeln, dass es jemand guenstiger und schneller hinkriegen koennte. Verwunderung, viele Fragen, bis hin zu Begeisterung. Du bist ja Familienvater .. wie kann MarsOne damit kompatible sein ? Das Training dauert neun Jahre. Meine drei aeltesten werden dann schon (fast) Erwachsene sein, in einem Alter wo sie (hoffentlich, wenn ich sie richtig erziehe) sehr selbststaendig sind. Unsere ganze Familie ist ziemlich Raumfahrtbegeistert – also sind meine Kinder meine groessten Fans. Ich hoffe ja, dass MarsOne und aehnliche Projekte unsere Zukunft der gesamten Menschheit, also auch meiner Kinder, positiv beeinflussen. Vaeter haben immer schon fuer die Zukunft ihrer Kinder einen Menge auf’s Spiel gesetzt. Ich bin felsenfest davon ueberzeugt, dass wenn uns der Technologiezugewinn einer Marserforschung und Kolonisierung gelingt, auch bald darauf das Anzapfen der enormen Energie und Rohstoffmengen des Sonnensystems (Asteroid Mining, zum Beispiel) gelingen wird. DAS wir mehr zur positiven Zukunft meiner Kinder beitragen, als irgendetwas anderes, dass ich haette machen koennen. Mir ist klar, dass das eine Betrachtung in groesseren Zusammenhaengen nahelegt, aber als Idealist macht das fuer mich persoenlich am ehesten Sinn. Da sind doch bestimmt ganz verschiedene Meinungen dazu, wie gehst du mit den negativen um, du wirst doch bestimmt viel kritisiert . Die meisten negativen Kommentare enstehen meistens, wenn gerade diese groessere menschliche / zivilisatorische Perspektive nicht in Betracht genommen wird. Natuerlich kann man mit seinem Leben auf der Erde auch jede Menge gute Sachen anstellen, aber wenn man in etwas “astronomischeren” Weiten nachdenkt, dann waere es sicher hilfreich fuer die Menschheit ein zweites Standbein aufzubauen. Ob das nun mit MarsOne gelingt oder nicht ist da schon fast zweitranging. Im Sinne von: Man kann nichts erreichen, dass man nicht wenigstens versucht. Man braucht viel Überzeugung und Charakter um drüber zu stehen, aber gibt es auch Augenblicke wo du zweifelst? Was sind das für Gedanken? Welche ängste hast du und wie überwindest du sie? Dasselbe, was einem durch den Kopf geht, wenn man alles zurueckgelassen hat und sich als Moench im Dschungel von Sri Lanka wiederfindet Man braucht schon ein positives Gegengewicht/Motivation und es hilft einem sich daran zu gewoehnen, dass man ein sehr gefaehrliches Leben fuerhen wird, wo der Tod weit naeher ist, als auf der Erde. An den Gedanken sollte man sich schon sehr frueh gewoehnen. Was ist dein schönster Gedanke zum Mars? Erforschung! Rauf auf den hoechsten Berg des Sonnensystems! Runter in die tiefste Schlucht des Sonnensystems! Unterirdisch durch alte Lavakanaele wandern, neue Kolonien errichten! Unsere gesamte industrielle Zivilisation nachbilden, von Grund auf. Eventuell mikroskopisches Leben entdecken… Das ist alles so faszinierend und fantastisch. Hast du schon vom Mars geträumt ? Ja. Ich hatte einen sehr realistischen Traum. Der beschaeftigte mich dann noch einige Zeit. Ich habe normalerweise einen tiefen Schlaf und wach wohl eher zwischen meinen REM Phasen auf, erinnere mich also nicht oft an meine Traeume. Dieser jedoch war super realistisch. Ich war auf dem Mars, in meinem Anzug. Ich fuehlte den Anzug und das eigentuemliche Gefuehl, dass du auch beim Tauchen hast, wenn du durch ein Geraet atmest und dein ganzen Leben davon abhaengt. Meine Sicht war durch den Helm etwas eingeschraenkt, aber ich stand auf dem sandigen Boden, kleine Felsen weit und breit. Es war noch jemand anders da, in einiger Entfernung. Hinter mir befand sich die Schleuse zur Basis. Die Luft war diesig und der Horizont sah seltsam aus. Aber ich fuehlte mich gluecklich, die bizarre Landschaft betrachtend. Ich habe wohl sehr gut gewaehlt Gerade weil sie mich so gut kennt, und weiss wie ich ticke, ist ihr klar, dass dies ein Lebenstraum von mir darstellt. Wir betrachten uns gegenseitig als beste Freunde und in der Hinsicht ist sie stolz und freut sich fuer mich. Auf der anderen Seite, ist uns beiden klar, dass es sehr viele anderen exzellente Kandidaten gibt und die Chance, dass ich in der Gruppe der 24 lande nicht einfach. Von daher beeintraechtigt MarsOne (noch nicht allzusehr) unser Leben. Wie gehst du mit dem Thema Beziehungen um? Das ist doch bestimmt nicht leicht! Wie schaut dein Leben aus, wenn es mit MarsOne nicht funktioniert, erzähl, was macht du beruflich? Wie stellst du dir dein Leben auf den Mars vor? Was überzeugt dich so sehr in den Mars zu gehen und alles hinter dich zu lassen, was du liebst? Und dein Leben aufs Spiel zu setzen. Ich glaube, ganz ehrlich, dass ich zu jener seltsamen Gattung Mensch gehoere die zuallerst Idealist ist. Ich habe mich seit Kindheitstagen mit Astronomie beschaeftigt, und der Gedanke, dass unsere gesamte Zivilisation, die ich sehr schaetze, auf einem kleinen Erdball hilflos im Weltall umhertanzt, zwingt mich ins Lager derjenigen, die fuer eine rasche Ausbreitung der Menscheit ins Sonnensystem pochen. “Don’t put all your eggs in one basket”, wie man in Amerika zu sagen pflegt Das ist also kein direktes egoistisches Motif, fuer einen Idealisten aber dann wohl doch wieder schon Auf der anderen Seite denke ich, dass ich meinen Kindern kein groesseres Geschenk hinterlassen, und kein besseres Vorbild liefern koennte, als eben dieses. Beide Texte behandeln ausfuehrlich die gesundheitlichen Aspekte einer Mars Mission (der erste der beiden links noch ausfuehrlicher und technischer). Ein Punkt sind zum Beispiel Blinddarm-Probleme, eine Sepsis waere tragisch…da OP Einrichtungen fehlen, sollte man wahrscheinlich den Blinddarm bei allen Astronauten entfernen. Auch Nierensteine koennten problematisch werden, wenn der Koerper den Knochen abbaut waehrend der 6-7 Monate langen Reise und es bei der Ausscheidung zu Komplikationen kommt. Allerdings gibt es da pharmazeutische Moeglichkeiten. Die Mission ist fuer mich erfolgreich, wenn es uns gelingt der Menschheit einen Brueckenkopf auf dem Mars zu schlagen und eine wachsende Kolonie erschaffen. Unsere Kinder/Jugend werden dann sagen: “Was haelt uns denn jetzt noch auf den Rest des Sonnensystems zu erschliessen und erforschen?” Der positive Effekt, den solch ein positiver Zukunftsoptimismus auf Gesellschaft, Technologie, Wissenschaft ausueben wird, glaube ich, kann man sich gar nicht ausmalen. Inwieweit wurden Sie über gesundheitliche Beeinträchtigungen während der Reise zum Mars informiert ? ( Hervorgerufen durch verschiedene Strahlungen im Weltraum, Schwerelosigkeit, psychische Schwierigkeiten… ) ? Als Bestandteil unseres letzten Interviews haben wir alle ungefaehr 60-80 Seiten Missionsdokumente studieren muessen. Darin wurden die gesundheitsprobleme natuerlich auch ausfuehrlich besprochen. Soweit ich weiss, haben sich aber die meisten Co-candidates auch darueber hinaus seit nunmehr fast 15 Monaten schlau gemacht. Gerade die gruppenspezifischen Facebook Seiten und Foren enthalten mittlerweile sehr interessante, detailliert technische und medizinsche Eintraege, die zusammengetragen und durchdiskutiert wurden. Und das ist bisher sicher alles nur ein Anfang. Persoenlich denke ich, dass alleine schon die Synergie die durch das Unternehmen MarsOne erzeugt wurde, ein ausserordentlich positiver Erfolg des Projektes ist: viele Menschen, die von einer Besiedlung des Sonnensystems/Mars getraeumt hatten, aber keinen ernsthaften Rahmen besassen, koennen sich nun Austauschen und verschiedene Ideen vorschlagen, die dann weltweit von Mitinteressenten intensiv diskutiert werden. -Wissen Sie ob die Astronauten während des Fluges ein Training ableisten werden oder wie man den gesundheitlichen Beeinträchtigungen begegnen möchte ? Ja, das ist laut Unterlagen vorgesehen. Allerdings, persoenlich, faende ich den Vorschlag von Dr. Zubrin, die Raumkapsel in eine Drehung zu versetzen und damit leichte kuenstliche Schwerkraft zu erzeugen wesentlich besser. Leider gab es diesbezueglich noch kein einziges Experiment auf der ISS – das kann sich aber in den naechsten 10 Jahren noch aendern. Sollte es dazu kommen, waere eines der groessten Probleme (neben der Strahlung) ueberwunden. Der Flug dauert ja immerhin nur 6/7 Monate. -Werden die Astronauten schon vor dem Flug körperlich/ psychisch vorbereitet ? Ich würde mich über eine Antwort sehr freuen . Davon bin ich fest ueberzeugt – Dr. Norbert Kraft, als leitender Mediziner von MarsOne hat ja jahrelange Erfahrung in genau diesem Bereich. Laut Dr. Kraft werden wir “froh sein”, wenn wir mit dem Training fertig sind – auf dem Mars soll es uns dann einfacher fallen als waehrend seinem Training. Viele der Kandidaten die ich kennengelernt habe bereiten sich allerdings schon jetzt physisch und mental vor. IT’S EASY TO FORGET HOW POWERFUL THE obsessions of childhood can be. Years later those dreams might seem as distant as Mars, at this writing about 162.6 million miles fromEarth. Lennart Lopin has already closed that gap when it comes to recalling just how badly he wanted to leave the earth as a boy after finding an outdated Star Wars toy catalogue at a store inAustria where he grew up. It sparked a desire that resulted in his attempt to commune with aliens via meditation when he was 7 or 8 (it didn’t work), and in a long, winding way become a monk — all long before he became a software engineer inSarasota, where he lives with his wife and four young children. In 2024 and 2025, he hopes to make up the rest of the distance to his dream, traveling for seven months and millions of miles on a daring, one-way trip to Mars as one of the first four people to colonize the rust-red planet. It would mean leaving his family behind, which he and they say they are prepared for. They could communicate but not in real time because of light-speed delay across space. There is a chance the settlers could one day return toEarth, but there’s no plan for that. A look back at a dune where NASA’s Curiosity Mars rover passed in 2014. NASA PHOTOMr. Lopin, who is 36, is one of 19 men and women inFlorida and 705 worldwide who were selected by Mars One from an original pool of thousands of applicants. The private nonprofit is based in theNetherlands and founded by entrepreneurs Bas Lansdorp and Arno Wielders in 2011. Mars One reports that 202,586 people originally applied, about 24 percent of them from the U.S., although that number has been disputed. Many dropped out or in video applications it was clear they were not suitable for the mission, although Mars One has not made it entirely clear how they whittled down so many so quickly. Her husband Eric, and her two grown stepchildren are supportive of her hope to go. Her friends have mixed reactions to the plan. Nadine, Colin, Jared, Summer, Lennart and Kaylee Lopin at home in Sarasota. EVAN WILLIAMS / FLORIDA WEEKLYAlthough some see Mars One as a long shot, it is arguably the most ambitious, single-minded space exploration program in the world and if successful would potentially have huge implications culturally, politically and economically. Incremental steps toward the 2024 launch include choosing a core group of candidates for the first and successive missions to Mars, and rocket testing and cargo missions ahead of sending men and women. The inflatable Mars One living space for four includes bedrooms, work areas, a living room, a place to grow food, bathrooms and a kitchen. RENDERINGS COURTESY OF MARS ONECandidates plan to deal with the isolation of space and a confined, stressful life on Mars, creating civilization from the ground up, in various ways. Catherine Anne Psarakis, a 20-year-old chemistry and music student living in Winter Park, plans to bring a good pair of headphones to listen to music. Candidate Holly Abernethy, a 20-year-old (the minimum Mars One age is 18) who hails from Cape Coral and is a student at Embry-Riddle Aeronautical University in Daytona Beach, is taking the first steps to prepare if she goes. Four colonists would share a total of 3,200 square feet of living space.“I am also trying to get involved with the Mars Desert Research Station in Utah for 2015 or ‘16 as a group of Embry-Riddle students. And next summer I have an internship with Frontier Design, in Brooklyn, N.Y., whose main focus is making space suits,” she said. Mars One has drawn criticism and become a curiosity, as well as inspiring interest, fascination and hope, from the scientific community and the media. It estimates the cost of the initial mission at $6 billion, with additional crews sent in the years to come. That is far lower than previous estimates to send people to the Red Planet, which have ranged from about $30 billion to $450 billion. Mars One plans to raise most of the money by creating a reality television show about the mission. Darlow Smithson Productions, an Endemol company, which created “Big Brother” and “Survivor,” will document the ongoing selection process. Broadcasting is expected to start at the beginning of next year. If all goes as planned (and by the nature of such a plan it won’t) viewers around the world will be able to follow on TV the daily dramas of the first settlers off Earth. The Real Houswives of… Mars? Well, not exactly. If it will work is a point of debate. A lack of funds is the group’s Achilles heel, Mr. Lopin and others agree. But he also believes the one-way mission has advantages. Other challenges to Mars One include a study by MIT researchers, who found that under current plans the Mars One settlers would produce deadly amounts of oxygen in their living habitats, in the course of growing food hydroponically, and start dying off in 68 days. One reporter who followed Mars One for a year, Elmo Keep, concluded that the program is a moral and ethical failure: An underfunded, ego-driven project that even if it does get off the ground is sending hopeful participants away from their families on a mission so hellishly lonely that it gave her nightmares in the course of writing the story. At least, Mr. Lopin argues, Mars One has articulated such a mission, and mobilized a worldwide group interested in seeing the plan carried through to completion. David Hanson, now 73, recalls watching the Apollo II moon landing on television as a boy: the first men on the moon had aspects of awe and novelty. Like many, he is skeptical but unwilling to be outright dismissive of Mars One’s audacious mission. “Something may come of it. Who knows?” he said. Even in the 1990s, Mr. Zubrin argued, the technology was available to carry a crew to Mars. In 1989, the Bush administration looked at Mr. Zubrin’s roughly $30 billion plan to send people to Mars and back and begin to colonize the planet. A NASA man-to-Mars mission was later estimated to cost $450 billion, a figure which Mr. Zubrin writes had ballooned because of the desire to bring all the fuel, food and other supplies along on the mission instead of traveling light. The resulting sticker shock kept such a plan from consideration ever since, he believes. “Living off the land — intelligent use of local resources — is not just the way the West was won; it’s the way the Earth was won, and it’s also the way Mars can be won,” he wrote. That would mean deriving fuel from an atmosphere made mostly of carbon dioxide; drawing water from the planet’s frozen ice and, hopefully, liquid reservoirs of water underground; growing food indoors. 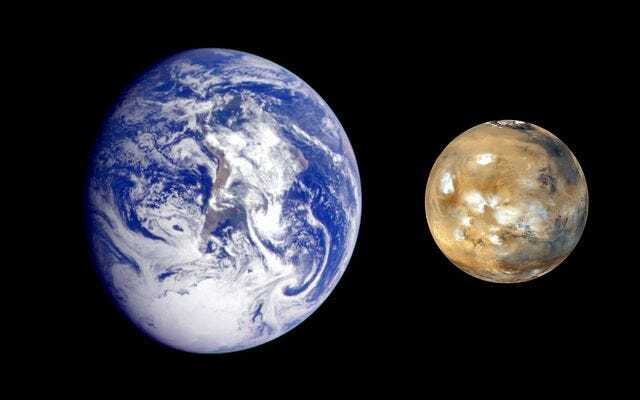 It is generally agreed that among our solar system’s planets, Mars is the only real option for human habitation (aside from the moon) because it is most similar to Earth. The fourth planet from the Sun, it is about 50 percent farther out than Earth, and was once warmer, with oceans, ponds and streams, Mr. Zubrin writes. Now much of that water, the key to potential life that excites researchers is ice or frozen mud. The landscape includes sharp-edged rocks, small hills and dunes, skies the color of salmon, and dust storms that can envelope the planet. Settlers would need to live underground or protect their dwellings from radiation and couldn’t go outside without a spacesuit. Temperatures range from 86 degrees Fahrenheit to -284 compared to between 136 and -126 on Earth. Mars has stark but undeniable beauty, including two moons. It’s about half the size of Earth, but contains the largest known volcano in our solar system. Olympus Mons is about the size of Arizona in diameter and 16 miles high. Much of what we know now about Mars has come from NASA’s robotic exploration of the planet, Mr. Zubrin explained in the preface to a 2011 reprint of his book, even if the idea of sending people there remains a fuzzy goal. NASA is preparing to test fly its new Orion spacecraft. There won’t be a crew inside this time, but the vehicle is designed to carry astronauts to deep-space asteroids, and eventually to Mars and back. Orion is set to launch from Cape Canaveral on Dec. 4. NASA employees as well as contractor Lockheed Martin will monitor Orion as it rockets to 3,600 miles above the Earth and makes two laps, testing numerous functions such as its parachutes, how radiation effects electronics, and the heat and acoustics inside the cabin as it reenters our atmosphere at close to 20,000 miles per hour with tempera- tures up to 4,000 degrees Fahrenheit. “This is really our first step in our journey to Mars,” said William Hill, NASA deputy associate administrator for Exploration Systems Development. Above the Lopins’ kitchen table is a whiteboard where his children, who are homeschooled, are learning new mathematics lessons each Saturday; a recent week’s lesson was on cubed roots. Mr. Lopin talked about an electronic currency that a new colony could use on Mars, similar to Bitcoin. He discussed why the peril associated with the mission is not unlike that of explorers past such as Christopher Columbus, whose crew had small, cramped living spaces aboard the ship that carried them to the Americas — an unknown, unplanned destination. When he mentions Elon Musk of SpaceX, his 9-year old, Colin, adds “And he’s my hero.” Colin is the biologist of the family. His daughter Kaylee, 5, is the mathematician, sleeping with a math book under her pillow. Jared, 8, wants to be an engineer. The Lopins’ daughter Summer is almost 2 years old. After Mr. Lopin found the Star Wars toy catalogue, he soaked up science fiction and astronomy books at the library before moving on to the adult section when he was 9 or 10, reading Albert Einstein, Charles Darwin and others. After reading parapsychology books he studied meditative yoga so intently, first as an effort to commune with aliens and later for personal reasons, that his parents became concerned. They still don’t understand why he would want to go to Mars. After graduating from high school, with a strong interest in Buddhism because he found it the most sciencelike of all religions, he went to Sri Lanka to become a monk. He would go down to the village in the morning for food, he said, and sit in a cave the rest of the day and night meditating. He did this for months, using techniques he believes could help on a planet that has been compared to living inAntarctica. After three years living the life of a monk, he left Sri Lanka in 1999. He returned to studying computer science, and about seven years ago was able to land a job in Florida after visiting a relative here. He currently lives in the United States on a work visa, with plans to obtain a green card and eventually citizenship. His son Colin sat at the table as he talked. Eventually we got around to what it would be like if his dad left. “All of you, right?” Mr. Lopin says. “Thank you!” Nadine Lopin says sarcastically from the kitchen, laughing. He asks how she feels about him going. “I’ll be 19,” Colin said. The investor sets the rules and the bots parse user profiles for criteria. Once thresholds are passed the borrower receives his loan instantaneously while the investor can auto-manage hundreds/thousands of loans while sipping a cup of tea playing with his kids. One of my favorite books of all times is Raymond Hull’s “How to get what you want“. It was published in 1969 and thus qualifies as one of the earliest “Self-Help” books (when that genre wasn’t quite as defined as it is today). However, in contrast to a lot of modern “fluff” Raymond Hull’s book describes a very unique systematic approach how to keep yourself focused on the goals that you actually aspire for – as the 100% five star ratings on amazon.com unanimously acknowledge. One of the reviewers thinks that “How to get what you want” even beats the all-time classic “Think and Grow Rich” – if you have ever read a personal growth book you probably know that that’s a pretty steep claim, one that I can wholeheartedly subscribe to. Because Raymond Hull’s system (when you read and study it) appears so programmatic I felt compelled to turn it into a program multiple times in my life. The first crude version was a C++ windows application made with Borland Builder and several web versions followed – none of which I ever was happy with until the most recent rebirth of the project that I started in 2012 and only now pushed to a level where I am satisfied. It had to withstand an extreme test: me actually wanting to use it So this time around I prefer it over Raymond Hull’s written approach, so – while it is still open for a lot of possible features and functionality – it’s useful enough and a joy to work with. In a certain way it’s my “thank you” note to Raymond Hull who passed away in 1985 and whose book has had such a profound impact on my life since 2000. The better something is in those six characteristics, the better suited it is at being a currency. 5.) Recognizability: A ton of effort is put into making bills easy to recognize/difficult to counterfeit. Think of the inks, watermarks, hidden strips, etc. 6.) Fungibility: Any $1 bill is equal to any other $1 bill. Bitcoin’s ‘backing’ comes from the fact that it’s exceedingly difficult to change any of the above and not in anyone who maintains the networks best interest to do so, unless a case can be made that it’s usefulness as a unit of account, store of value, and/or medium of exchange is increased in some way. It is also the only way to transfer value digitally without the need for a third-party. Money is basically favor vouchers. You do something for someone and they give you some item (gold, seashell, signed piece of paper, etc.) that society agrees gives you the right to call in that favor owed to you, but the cool thing is it doesn’t even have to be from the person you did the original favor for. The way Bitcoin works is instead of actually passing around gold or pieces of paper to record who did what for whom, a globally synchronized accounting ledger records this data in a cryptographically secure way. Since no tokens have to be physically transported, it is global and fast. But since no central authority controls it, it cannot be politically messed with, inflated, confiscated remotely, etc. Heidi Hecht It occurs to me that one of these days, we’ll be able to pay for things just by sending bits between implants attached to the back of our skulls. Lennart Lopin Think like this: while driving your “Tesla” you have an idea. Immediately, your implant gets busy and sends the idea to an online idea-market place offering your idea in exchange for a crypto currency of your choice (Marscoin, Bitcoin..). A prototyping company, maybe completely living in the cloud, purchases your idea and sends it with hundreds of others to a prototyping market place. A moon-based factory purchases these ideas and cranks out prototypes. A marketing company runs instant customer research campaigns on your prototyped idea on Mars. One hour later a huge manufacturing company purchases the IP rights and auto-negotiates a royalty with your personal avatar bot. All this happens fully automated. When you come home, parking your Tesla in the drive way and open the door, the screen in your living room displays billions of tiny microtransactions that flow into your account as your “idea” hits the “virtual shelfs” of retailers that have already purchased the product that resulted from your idea….